Help us raise money for the National MS Society Walk! The National Multiple Sclerosis Society is dedicated to creating a world free of MS, but they can’t do it without our help. Back in Motion staff members will be fundraising & collecting donations for the National MS Society Walk on 4/27/19. We are making this a friendly competition! 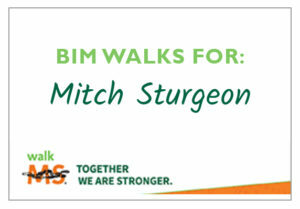 The employee to raise the most money will have their donation matched by BIM! We will be participating in this cause in support of our patient, Mitch Sturgeon, who has been a huge part of our family here at Back in Motion. You can also donate directly to Mitch’s page!